Keynote speaker was Peter Auhl, the former Chief Information Officer of the City of Adelaide. Peter was the person responsible for establishing the Smart City strategy for Adelaide and the architect of the Ten Gig Adelaide connectivity project. Peter is the 2017 CEO Magazine national “CIO of the Year” and also forms part of the CIO50 of 2017 and 2018 for the top fifty most innovative CIO’s in Australia. The seminar was attended by 60 guests from the Wagga Wagga community, Sydney and Canberra, representing all the key stakeholders necessary to provide the resources to support the implementation of the strategy and execute the project. Guests included Mayor of the City of Wagga Wagga, Greg Conkey OAM, Dr Joe McGirr, Member of the State seat of Wagga Wagga, Wes Fang MLC, representatives of State & Federal Government agencies, Charles Sturt University, the Chamber of Commerce, Utility providers, Private Enterprise – Large, Small – Global, National & Local and Entrepreneurs & Innovators. The agenda was designed as ‘conversational’ and ‘non-technical’, with the aim of stimulating thinking, sharing experiences & preparing for engagement with Wagga Wagga City Council as the ultimate custodian of smart city strategy, through bringing key stakeholders together in a spirit of collaboration to establish common ground and a starting point for the Smart City journey by delivering an informed oversight of the creation & implementation of a Smart City strategy. The concept of smart cities isn’t a new one – it was developed in the mid-1990’s to describe cities that were leveraging information and communication technology to foster economic growth. Since then the concept has broadened to talk about a wide range of things. 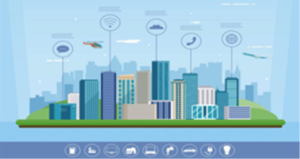 In 2016, the federal government released its Smart City Plan and placed the concept at the forefront of discussion about the future of our cities. The Smart City Plan refers to Smart Cities as cities that embrace smart investment, smart policy and smart technology. The accompanying program encourages the delivery of innovative projects to improve the liveability, productivity and sustainability of cities and towns across Australia. In the two rounds of funding to date, $50 million has been allocated to 81 projects out of a total of 278 submissions from around Australia. Unfortunately, Wagga Wagga has not participated to date. To date, it could be argued that Wagga Wagga’s foray into the world of smart cities has been ad hoc – with stakeholders promoting and implementing individual projects as opportunities arose – but with no underpinning strategy for the city. Committee 4 Wagga has been at the forefront of a number of smart city initiatives, with significant community projects such as the introduction of CCTV in the main street of the CBD and the Lights 4 the Lake project at Lake Albert. The Wagga Wagga City Council is, through Riverina Eastern Regional Organisation of Councils (the councils of Bland, Coolamon, Cootamundra-Gundagai, Greater Hume, Junee, Lockhart, Snowy Valleys, Temora, Wagga Wagga, Goldenfields Water and Riverina Water), pursuing the Southern Lights project to capture cost savings and improved city lighting by installing smart lighting throughout the city. The Committee 4 Wagga has adopted the City of Adelaide as the model on which the project can be based. Adelaide is considered a benchmark city, a city that is recognised globally in this regard. Further to the extensive documentaries on Adelaide available in the public domain, Committee 4 Wagga through its affiliation with the Committee 4 Cities & Regions Network body, had the opportunity to engage directly with the Committee 4 Adelaide and the City of Adelaide to gain a deeper understanding of the Adelaide smart cities journey from the people who have lived it. By understanding the Adelaide experience, we have the opportunity to not only see the implementation and delivery – but importantly – the return on investment, as Adelaide’s economy builds off the back of the smart city and Ten Gig Adelaide commitment. Feedback from attendees has been extremely positive in seeing the value for our community. There are clear benefits from smart city thinking and problem solving to improve livability, community facing technologies, business connectivity and enhancing the benefits from key infrastructure precincts such as the Bomen Industrial Estate, the CBD and the Health Precinct through a connectivity platform based on the Ten Gig Adelaide network. Committee 4 Wagga encourages Wagga Wagga City Council – the delivering body for smart city strategy – to take a holistic, visionary leadership role in developing Wagga Wagga as a smart city by engaging & collaborating with key stakeholders to make informed and timely decisions on implementing Smart City strategies – to quote Paul Budde, one of the world’s foremost telecommunications management & business consultants – “The key to a smart city is a smart council”. Friday’s seminar is not an outcome – it is but the first step in the journey. There must always be ‘next steps’. The first of the next steps in fact occurred on the Friday afternoon, with the Wagga Wagga City Council accepting our invitation for Peter Auhl to meet ‘in-house’ with council staff to discuss smart cities and council’s role in the journey to making it all happen. I can say that Committee 4 Wagga, the Chamber of Commerce, Charles Sturt University and our Entrepreneur leaders are united and ready to jointly collaborate with Wagga Wagga City Council in making Wagga a ‘smart city’ and further enabling the economic growth and liveability of the city. We eagerly anticipate a similar position from Wagga Wagga City Council, with the expectation that Council will prioritise and adequately resource the initiative to make this happen in the immediate future.